I recently had a chance to meet a few eCommerce store owners over a cup of coffee, and got talking on how easy it is to start an eCommerce business today. Among the people present at the meeting, almost 50% started off as Dropshippers; and I was thinking how easy it has become to start a dropshipping business in 2018. 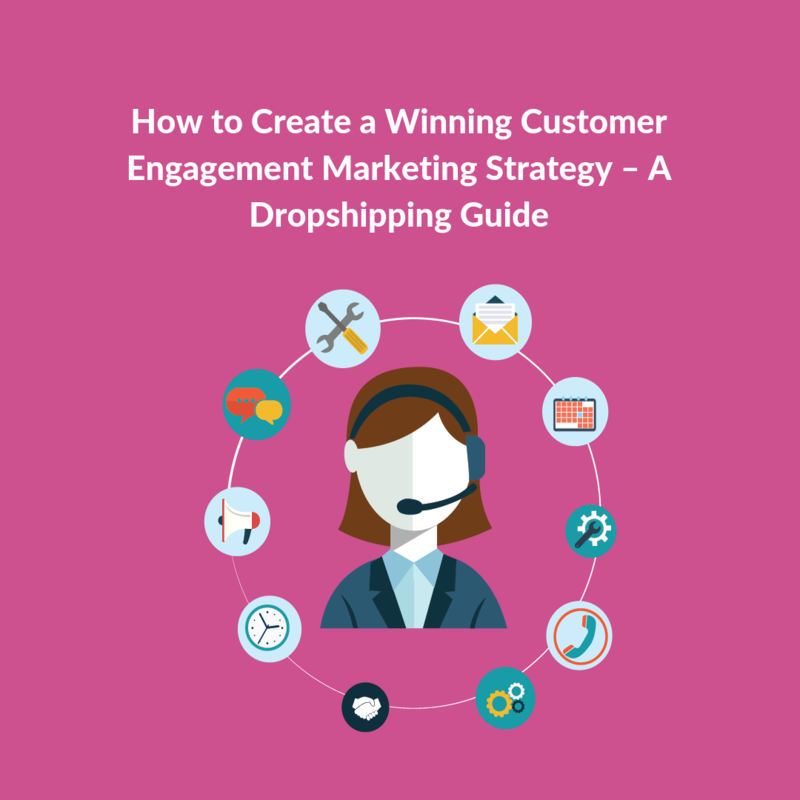 With all the technology out there, most of it just a few clicks away, and all the Shopify and Oberlo tools and better logistics support and with a good customer engagement marketing strategy, one can easily jump into the Dropshipping bandwagon. But, on the other hand, if everything is so readily available, what is the one thing that makes one eCommerce business a success and the other, a complete fiasco? The Answer? Customer Engagement. 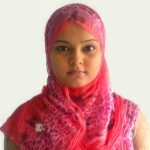 Reputation is of immense importance for any successful eCommerce company. It is reputation that gets you customer loyalty and results in customer retention. To a Dropshipping business, an enriched customer experience is the foundation of reputation building. And it’s also the key factor in growing and sustaining a viable dropshipping business. An eCommerce customer engagement marketing strategy is one that will allow you to offer great experiences to your customers in terms of shopping and support are the business tactics that only you have a control on; even when you don’t have a control on your inventory and fulfillment. What is a customer engagement marketing strategy? Quite contrary to what a lot of people might understand, customer engagement ideas and techniques are not just focused on encouraging customers to spend more. And while, that may seem as the logical way to grow your eCommerce business, it is definitely not how customer loyalty is built. Why is a customer engagement marketing strategy important? Customer engagement in today’s dynamic and very volatile marketing landscape, is all about improving relationships with your customers by focusing on doing things that matter to them. Customer engagement is not just transactional anymore. To stand out from the rest, eCommerce businesses need to delve deeper and think differently around their customer engagement strategies if they want to develop the sort of relationships that they want with their customers. Customer engagement marketing is a new and unique marketing strategy that delivers relevant, calculated and personalized messages at the right time to existing or prospective customers. For example, imagine you open your inbox and find a personalized message from Callie, a manager with an online beauty products’ company that you have recently purchased a lipstick from. Callie is now mailing you to let you know that the store is offering a 30% discount on the brand of lipstick that you purchased, and since you purchased similar items few days back, this information might be of particular interest to you. She then closes the email by thanking you for your past purchase. What is Callie doing here? She is using a customer engagement marketing strategy by sending you an offer that may match your interests based on your past buying behavior. Thus, Callie is taking this opportunity time to reach out and encourage you to buy more products from her company. Another thing to note here is, although Callie’s ultimate goal is to sell more, she knows what her customers want/like, and she also understands that this particular information may be of some value to her customers. That is the goal of customer engagement. Personalization; to make the customer feel involved. While we all know that the eCommerce industry is slated to grow more, and dropshipping can be a great way to avoid logistical difficulties if you are planning on starting an ecommerce business, the fact remains that the market is highly competitive. Hence, entrepreneurs need to follow strategies to improve customer engagement. CRM is much more than a boring and functional side of customer experience. It is CRM that helps brands understand their customers and segments them according to their Customer Lifetime Value. CRM provides the tools that hold everything around customer journey together. CRM is all about having the right communication at the right time; and as such is vital for brands to succeed, as far as customer experience is concerned. Understand the customers’ needs and expectations across all silos – from browsing the website to sales and delivery. Identify opportunities for your eCommerce company to be proactive. For instance, SoCal Edison emailed 30,000 customers whose bills were going to be higher, and dispatched emails warning them of the same and offering conservation tips – all based on their smart meter data. Customers loved it. Expand the voice of the customer to listen to feedbacks and reviews which can come from email messages, online chats, social media sites, forums and surveys, and from your call centers. Create online customer engagement social media communities to provide support, converse, engage and to gather ideas from the customer base. Use conversational tools such as instant messaging, and make sure that you move from mass communication to more personal one-to-one communication. Go multi-channel (especially using on-site CRM), if you really want to have your CRM efforts impact your customer retention and increase customer loyalty. Why is CRM so important in Dropshipping eCommerce? CRM allows you to easily register leads and contacts, making it easier to stay in touch and nurture your marketing and sales. The ease with which a business can track and manage its customer interactions with the help of CRM, makes it possible for them to understand, meet, and exceed customers’ needs and expectations. CRM encourages customer feedback the non-intrusive way, which in turn improves business performance and helps in building customer loyalty and satisfaction. CRM’s USP lies in its ability to keep all the information at one place, which increases a business’s productivity and efficiency during customer’s interactions. How does customer engagement marketing strategy impact customer loyalty? Customers who are more engaged, are likely to be more loyal. A good customer engagement marketing strategy reflects itself in a number of actions – including social sharing, purchases, feedback and referrals. When customers are loyal they become your word of mouth marketing channel and with actions such as repeat purchases, they become your vocal brand advocates. Each of the above-mentioned actions indicate that a customer wants to be a part of your brand community. As a result, focusing on how to deepen your relationship with your customers should be your focus area if you want growth and success. How to calculate customer engagement? Guest checkout rates: Fewer guest checkouts imply that more customers are creating an account at your dropshipping store. Purchase frequency: A higher purchase frequency means you have returning customers who are engaging with your store more often. Average order value: A high average order value indicates that customers are developing emotional connections with your brand and are loyal. Churn and retention rates: A lower customer churn rate means more committed customers are willing to stay engaged with your brand. When you regularly include these customer engagement metrics in your list of key performance indicators, your focus never waivers from the greater objective of increasing customer loyalty. Start a Blog: Blogs are platforms where your customers can interact with your brand on your website. Develop and post high quality content on your blogs. Look at some of the best eCommerce blogs for inspiration and see how they are nailing it. Stimulate discussion and encourage participation through these blog posts. Sell the benefits, not the Products: Use the category page of your online store for SEO benefit. Inject some wit where relevant, but write for your audience. Provide detailed and unique copies of your product descriptions and describe how your products can help your customers.Look at this online store of the Natural History Museum. Apart from scientific correctness of the product, there is humor and crisp-ness. Have a Value Proposition: Your website design should tell people what your site and products are all about. And although most users are reluctant to read – unless they have to – you should always make sure the website states what your brand stands for. Social Proof: Include social sign-ins, embedded tweets etc. on your website. Don’t disintegrate social media from your online shop. Look at ASOS for example. Their ‘as seen on me’ feature encourages users to browse and even participate in their content creation, giving up data in the process. Here are some things to think about for your dropshipping business when it comes to customer service. 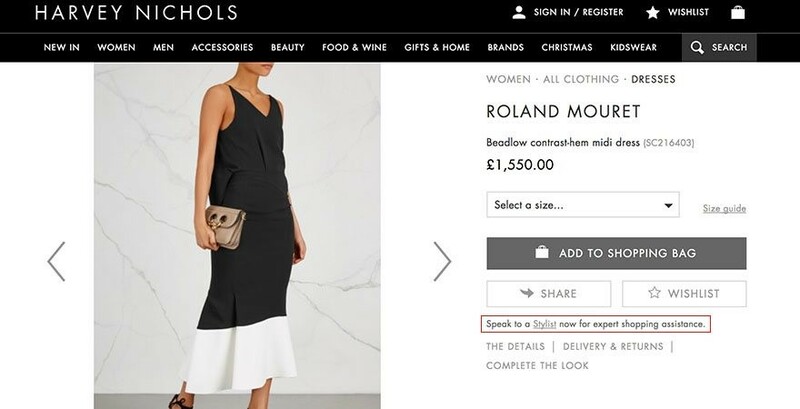 Harvey Nichols calls their customer support team Stylist. The Stylist’s job is to help customers hunt for the right product. If they get stuck, they can use a form to share their name, email and phone number and their question. The form is tied to the exact product. So, if a customer is looking for accessories to pair with a specific dress, the Stylist will know which dress needs the accessories. 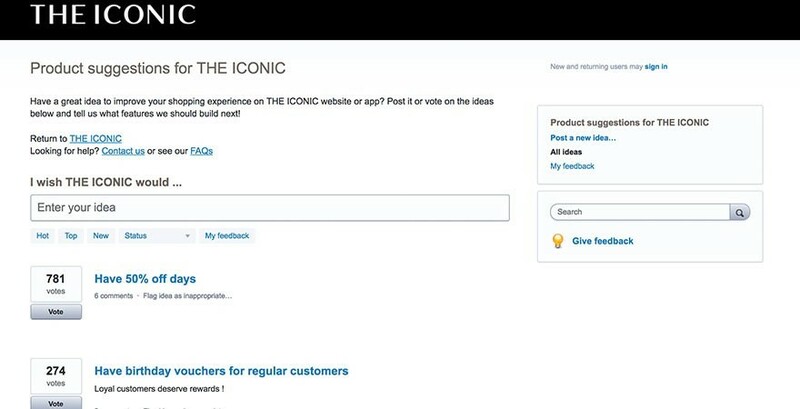 The Iconic has added a ‘Share Your Ideas’ section to allow their customers decide what features or perks your brand should offer. There is also an option where other customers can upvote the ideas so that your brand can take action sooner. Premium Teas – This online store has a perfect plan for their customers. The teas are displayed in a simple path for customers to look through and select the most coveted one. Emphasis is on visual portrayal rather than shrouding the website in excessive content. When you tap on any item, you are taken to another page which has a point by point portrayal of the tea. New Chapter – New Chapter, a P&G brand, has some good work in terms of innovation and consumer engagement on their site. 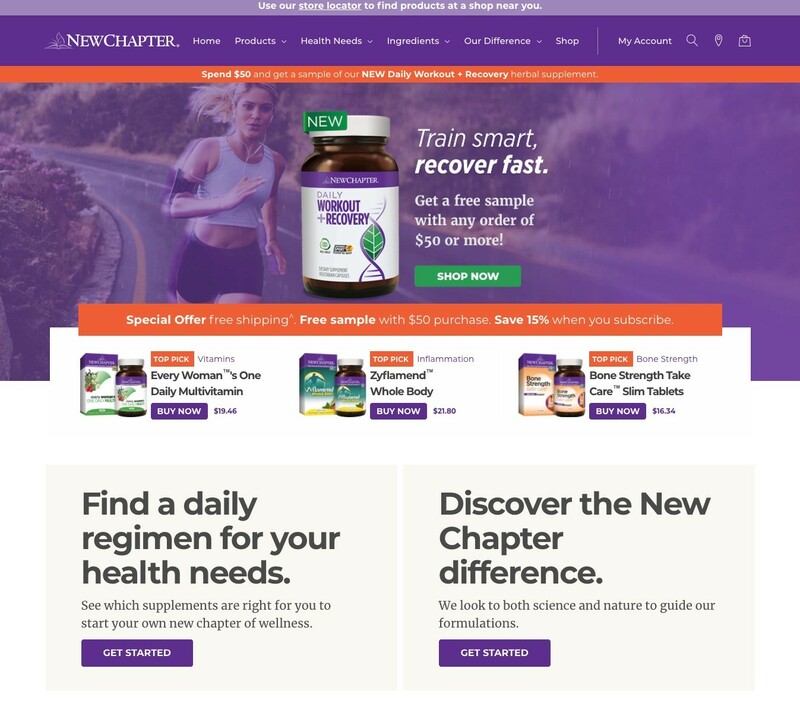 From quizzes to bundles, New Chapter provides a personalized, choose-your-own experience for its customers. To be able to create great experiences with a solid customer engagement marketing strategy, you need to ensure that you make your brand a need to your customers. And for that, you need to have an understanding of what they need. Sounds pretty complicated, I know. But, this is all there is to it. Knowing how to better serve your customers allows you to create a customer centric brand. The better your customer experience, the more likely it is that they’ll keep returning to your store. Show your customers some appreciation, write them personal thank you cards when they order products, offer them VIP deals, surprise your returning customers with a free gift for fun. You could do lot of things to woo them. The crux of the matter is, the more you give to your customers, the more you’ll get back from them.